The vast majority of fsx planes do not transmit their squawk code to ATC so everyone normally shows up as squawking 1200. This is a bit annoying as ATC assign different squawk codes depending on where you are flying too. Codes starting 1xxx might be for an IFR circuit, 2xxx departing to the north and 3xxx could be a Daventry 3 Echo departure etc. This means if more than one tower is in operation we can look at the squawk code and deduce where to route the traffic. Or if you're like me and forget you can just look at the squawk code rather then keep asking the pilot. So I thought it would be useful to fix this squawk problem so I've written a tiny gauge called "ident". If you push ident it will go red for a few seconds. In real life this helps ATC identify you on the radar screen. Here I change the squawk code to 0000 for 5 seconds. If your ATC has downloaded my advanced radar screen he will also see something similar. The gauge itself is just a tiny circle that that runs in the background ensuring your transponder codes are relayed to ATC. For this reason it makes sense to place the ident gauge on the same panel as the transponder. This means that if the panel is not visible then the code won't run in the background either. Of course if you use a virtual cockpit to change the transponder then this won't work or you can add the ident code to the vc as well. Open up your fsx gauges directory. This is in your main fsx directory not the gauges directory for each plane. You can download these other config files to add the fix to these other standard planes that come with fsx. How to install into other planes not listed above. I'm going to talk you through installing this onto the B737. You need to find the panel.cfg file for the plane. On my PC it's here. Make a copy of this file just in case! Then open the panel.cfg using notepad. Look for the section I've listed below. The panel itself is made up of 7 gauges, we need to add the ident gauge to this bit. Because the ident button is going to be on top of the existing xponder gauge it's safest to load it last. 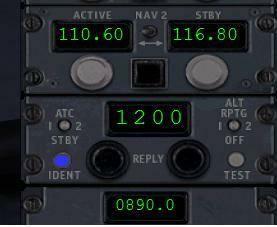 The first part tells fsx what gauge to load, the numbers pass the position and size as follows. 20 pixels in from the left. 315 down from the top. You can see the existing xponder gauge starts at 271 and the next gauge below is 340 so a number between the 2 makes sense! 12 pixels wide. You can change this and the control will stretch or shrink. 12 pixels high and as above. If you want to understand more look here which covers in detail how the panel.cfg works amongst other things. If you have the deluxe version of fsx these docs are also on your dvd as part of the sdk. 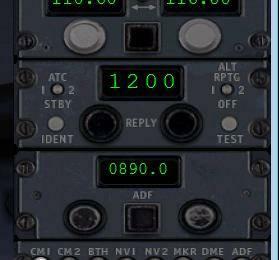 Tip: Run fsx in windows mode alongside notepad while you make the changes to panel.cfg. Each time you make a change save the cfg file then in fsx push ctrl+; This will quickly re-load the plane .